The threat of global warming and impending danger of natural disaster constantly threat all of us. To minimize this, many petroleum-fueled car owners are interested to convert their vehicles to environment-friendly electric cars. These electric cars came into existence in the mid-nineteenth century and throughout that period as well as the early twentieth century, these vehicles had gathers prominence. Instead of internal combustion engines, these automobiles use unconventional fuel and use electric motors and motor controllers to get the required driving force. These cars are also called the battery electric vehicles since, batteries form the integral part of these cars and provide the necessary power for plying. Many people are converting their traditional vehicles into these electric cars from the comfort of their homes; however, there are some salient points that have to be considered always, while doing this conversion at home. A DC controller and a DC motor are required for conversion and the person involved with this job should choose the accurate voltage at which the system will work. Though the voltage is usually between 96 and 192 volts; however, this decision is primarily determined by the number of batteries, type of motor and the type of controller that the car is supposed to use. Though a person has plethora of choices regarding the battery technology, he will be best served if he uses lead-acid batteries. Marine deep-cycle lead acid batteries, golf cart batteries and high-performance sealed batteries are the other battery options available to a person. These batteries are generally flooded, gelled or may even be made from absorbed glass mat electrolyte; flooded batteries being the least costly but at the same time these have the lowest peak power. After arriving at the final decision regarding the motor, controller and the batteries, one can proceed for the electric car conversion. To carry out the DIY electric car conversion process in a smooth and efficient manner, you should first understand the important terms and procedures related to it. • The controller delivers the power from the batteries to the motor for the vehicle to ply. • Batteries act as the storage compartments for energy required for these electric cars. • The attraction and repelling motions created by the magnets of electric motors or DC motors enable the engine to start and provide the necessary force for the car to move. The following points serve as basic guide or step-by-step process of the conversion that you need to follow while converting your traditional vehicle into electric car, at home. • First, remove the engine, gas tank, exhaust system, clutch and the radiator from your conventional vehicle that you want to convert. • Before mounting the new motor in the vehicle by using custom mounting brackets, connect an adapter plate to the transmission system. • You should create a gear reduction system by pinning the existing manual transmission to the 1st or 2nd gear. This will allow optimum efficiency of the electric motor. • After the above are done, you can mount the controller. • Build brackets, which will enable the batteries to stay in place and will complete their installation process. • Use a welding cable to wire both the batteries as well as the motor to the controller. • After this install a charging system and should also remember to install a DC-to-DC converter to charge the spare battery. • You should also install a volt meter to keep a track of the charge in your batteries. Last but not the least, you should install a contractor or a large relay, which will enable you to connect or disconnect the battery pack to and from the controller. If your vehicle has a power steering, remember to install an electric motor for that power steering pump, too and if it has an air conditioning unit, a separate electric motor has to be wired up and mounted for the compressor. Install a vacuum pump so that you can operate the brake booster of the power brakes and it may even be necessary for you to install some reverse switches to the controller, depending on the conversion. Now your vehicle is ready and you can rewire the ignition switch to take your environment-friendly vehicle for a test drive. 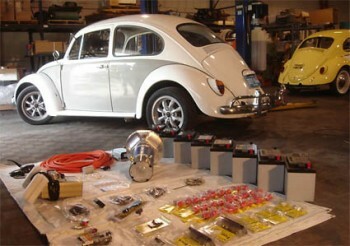 Do you need help with your EV conversion project? 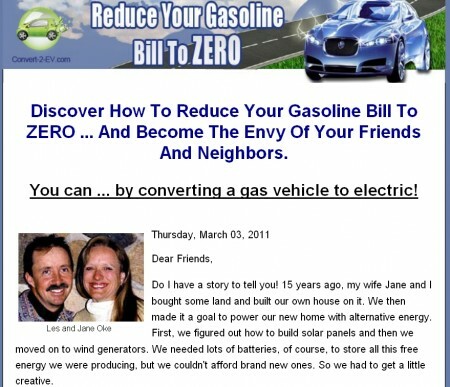 If you do, check out the Convert2EV ebook by Les and Jane Oke. The Okes are from Canada and they have been living and green lifestyle for more than 10 years. To maintain a small carbon footprint, they convert conventional automobile into pure electric car in their home garage and use the homemade EV to move around. The Convert2EV guide was written based on their experience throughout the years retrofitting more than a dozen cars into EV. Click on the link below to visit the Oke’s web site right now.